Palm trees come in more sizes and shapes than people and offer a beautiful long-term and efficient answer to many of gardening’s dilemmas both indoors and out. There are fast growing varieties, slow growers, some which stay small, some are dwarf, some are tropical, and some are hardy to extreme cold. As you look over many horizons, tall palms swaying in the breeze offer a signature identity to many regions throughout the Sunbelt. What would Palm Springs be without palm trees, or what would Hollywood and Beverly Hills be without palm trees lining the streets? Who can think of Miami or Palm Beach without the vision of a palm studded seashore? 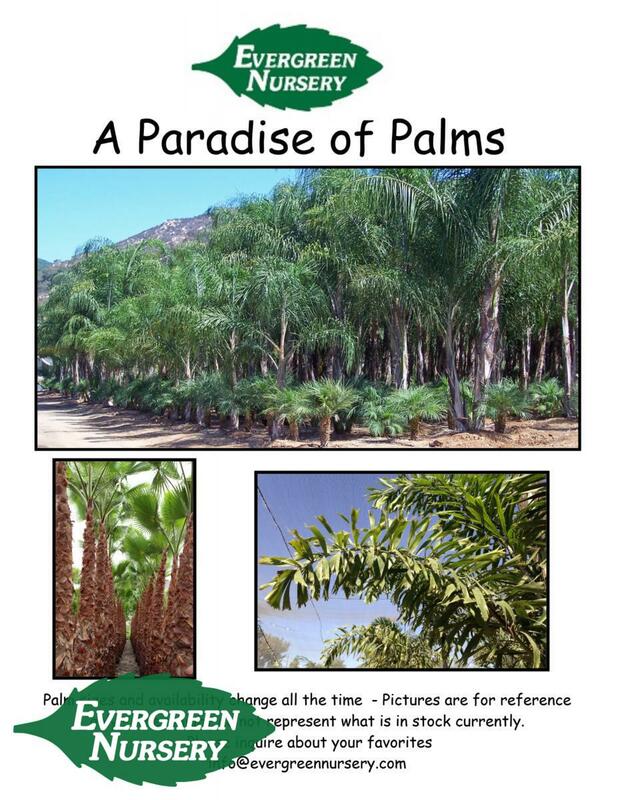 So, if you want a tropical paradise in your own yard or office or perhaps just a hardy, drought-tolerant accent by your front door or in your office, come check out the many varieties of palm trees commercially available at Evergreen. Be sure to consider growth rate, overall size, and cold hardiness as you search through the different varieties. Remember that the cold hardiness temperatures listed below only mean that the palm tree can take a bit of that cold temperature, but a sustained frost at temperatures listed could burn the tops of the palm trees. It is likely that they could come back from this. As long as the frost doesn’t get to the heart, it will probably recover. Fronds are medium green and stiffer than that of the Queen Palm’s. Likes well drained soil with moderate watering. Prefers the sun but will tolerate shady conditions. Grows moderately to 30’or more. Hardy to 28°. It is rapid growing palm tree, with a straight single trunk. Has long arching, dark green, featherlike fronds. Prefers full sun or light shade. Drought tolerant, but does grow better with regular water. Can reach heights of 40 feet or more. Hardy to 22 degrees. Clusters of medium bright green fronds arch at the ends of each branch. Trunk has a swollen base that can get several feet across. Will grow indoors or out. Grows slowly to 15 feet tall. Hardy to 32°. Grey-blue, stiff textured, fan type fronds. Broad palm tree that will need some room to spread. Moderate growth to 30 to 40 feet tall. Prefers full sun but is tolerant of some shade. Hardy to 28°. Striking silvery blue, fan shaped fronds. Takes many soils and has good drought tolerance. Takes heat and wind. Requires full sun. Grows slowly to 20 feet tall. Hardy to 18°. Meduim green fan-palm like fronds, with a stout trunk. Grows in full sun and tolerates beach as well as desert conditions. Grows slowly to about 30 feet tall. Hardy to 20°. Stout trunked, with arching, gray-green, feather shaped fronds. Takes many soils and has good drought tolerance. Prefers the sun but can tolerate some shade. Grows slowly to 10-20 feet. Hardy to 15°. Leaf bases form a triangular trunk. Grey-green to blue-green fronds are feathery and arched. Likes sun or light shade and is drought tolerant. Grows slowly to 20 feet tall. Hardy to 28°. One of the hardiest palm trees that has withstood temperatures as low as 0°. Produces multiple trunks with small fan type fronds. Very drought tolerant and prefers sun or partial shade Grows slowly to 20 feet tall. Grows very slowly to 10 feet tall. Dark green fronds that get about 3 to 4 feet long. Takes full sun or total shade. Tolerates drought, but does better with regular water. Hardy to 15°. Tough plant. Slender trunk with 6 to 12 foot long, dark green fronds. Needs shade inland, but will grow in the sun near the coast. Grows slowly to 30-40 feet. Likes regular water and is Hardy to 26°. Roundish, fan-type fronds that are dark green and shiny. Fronds droop at the outer edges. Slow growth to about 30 feet tall. Likes regular water and full sun. Tolerates some shade. Stiff, grey-green, feather-shaped fronds that grow on a slender trunk. Drought tolerant and requires full sun. Moderately fast grower to 80 feet tall. Hardy to 15°. Very popular dwarf palm tree. Feathery, fine-textured fronds. Plant as single or multiple trunk specimens. Slow growing to 10 feet tall. Likes regular watering. Hardy to 28°. Feathery type, medium green fronds. Trunk is whiter and a bit more robust when compared to a Queen Palm. Likes moderate water and sunny to partially shaded location. Grows moderately to 30 feet tall. Hardy to 28°. Popular indoor plant or outdoor shade specimen. Bamboo-like trunks and dark green narrow leaves. Grows slowly to 12 feet tall. Tolerates some dry conditions but does better with regular watering. Hardy to 30°. Popular indoor plant or outdoor shade specimen. Slender, bamboo-like trunks and dark green narrow leaves. Grows slowly to 18 feet tall. Larger leafed than Lady Palm. Hardy to 30°. Similar in look to the Mediterranean Fan Palm tree but grows as a single trunk palm tree. Fronds are dark green and fan-like. Moderate to fast growth to 35 feet tall. Takes temperatures down to 10° or lower. Similar in appearance to the Windmill Palm tree, but has a bigger leaf and a spiny trunk. Grows slowly to 20 feet tall. Likes sunny to partially shaded areas. Handles drought but likes some regular water. Hardy to 20°. Similar in appearance to the Mexican Fan Palm tree. Has a thicker trunk with a wider frond. Fast growing to 60 feet tall. Likes full sun and can handle drought conditions. Hardy to 18°. One of the most widely planted palm trees. Tall slender trunk with compact crown and dark green fronds. Likes full sun and is very drought tolerant. Fast growing to 100 feet tall. Hardy to 20°. Narrow trunk with plume-like fronds that resemble foxtails. Really interesting. Needs good drainage. Prefers sun to part shade. Grows moderately to 25 feet tall. Hardy to 32°.